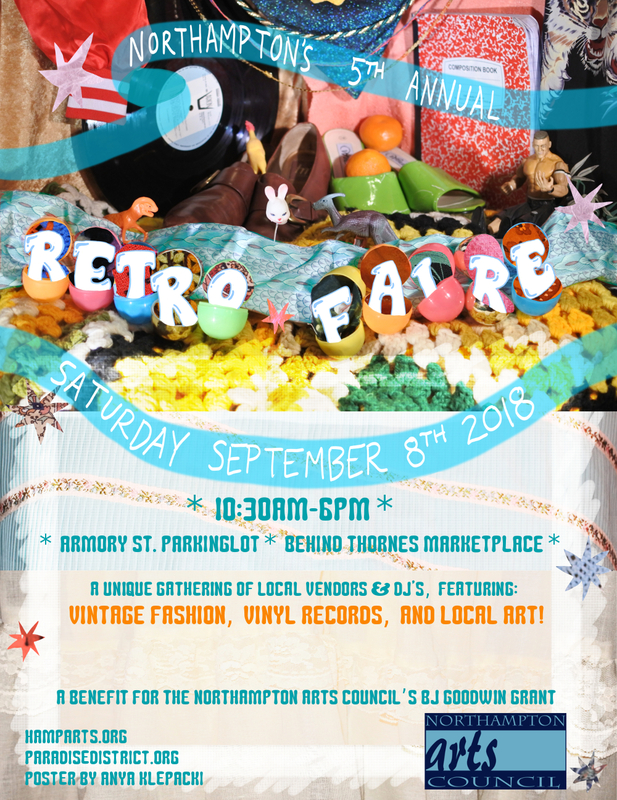 The Northampton Arts Council invites vendors of vinyl records, vintage wares and handmade art to apply to our our 5th Annual RETROFAIRE on Saturday September 8, 2018. RETROFAIRE takes place downtown Northampton in the area between Thornes Market and the Parking Garage. This year the event will feature a variety of live DJs spinning vinyl throughout the day. The open-air market is produced by the Northampton Arts Council. Our goal is to showcase the most creative artisans, unique retro clothing vendors, and hard-to-find vintage instruments and vinyl albums. All proceeds benefit the Northampton Arts Council’s BJ Goodwin Grant. A grant designed to provide direct assistance to a Northampton-based artist, writer or arts organization in recognition of exceptional work and to support the further development of artistic talents.